Regular engine tune-ups bring power and efficiency back to your car. We visually inspect all of your engine components and install new parts (including spark plugs and fuel filters) as needed. After a tune-up at our shop, you’ll discover your engine starts easier, runs smoother and is more efficient. A regular engine tune-up will lower emissions, improve fuel economy and restore lost power. When you get car tune-ups based on your vehicle manufacturer’s recommendations, you’re investing in the long-term health of your car, saving you time and money. Big or small, we do it all! From brake service to engine replacement, we have your auto repair needs covered. 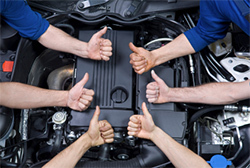 Serving drivers in Cameron Park, CA and all surrounding areas, our staff of ASE certified mechanics have a well-rounded knowledge base that we can say we truly specialize in everything. We work on foreign and domestic cars, light trucks, heavy duty diesel trucks, motor homes, and much more. If your car has a problem, we can diagnose it.